Divinity: Original Sin was a pretty fantastic game by just about any measure, but Larian Studios boss Swen Vincke wasn't entirely happy with it. In fact, he spent a full paragraph of his most recent blog post knocking the story, combat, interface, dialog, loot system, high-level character progression, and a number of other aspects. The problem, he said, was primarily due to a lack of "development capacity," which forced a number of compromises on the game. To avoid that in future projects, Larian is expanding. 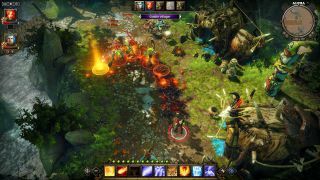 Vincke revealed that the studio has begun work on two new RPGs, both of which will use the engine created for Divinity: Original Sin, which is one of the reasons work on that game is continuing. "It means that whatever we fix in D:OS, will automatically be present in our new RPGs. It also means that we can spend most of our resources on developing new cool stuff without having to reinvent things that worked well already," he wrote. "And it immediately gives us a rationale for putting unreasonable amounts of effort in fixing the things we didn’t do that well in D:OS, meaning our existing players will continue to get improved gameplay for as long as we can maintain compatibility." To support that effort, Larian is increasing its headcount and opening a new office in Quebec City to take advantage of "the experience and talent that’s running around there." Vincke acknowledged being "quite apprehensive" about the move, but said, "The commercial success of D:OS has given us an opportunity to make true some of our bigger RPG ambitions and I’ll be damned if we don’t seize that chance. Going all-in paid off in the past so we might as well try again." Vincke asked players to continue providing feedback on Original Sin, and to sound off about what they'd like to see in future games as well. He also reposted a "year in review" video that emphasizes the impact of player input on the development of the game—and that hints at at least one more big change coming in the future.